The world of adult colouring is your oyster with the training, confidence and an official ‘Creative Coloring Course’ Certificate of Completion behind you! On completion of the course not only do you gain incredible skills, but you will be awarded with an attractive pass certificate – printed with your full name, final passing score, date of completion and a full list of the training modules you have completed. 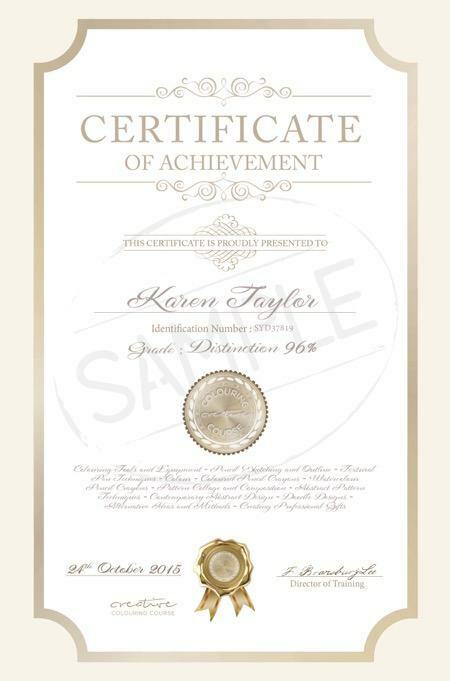 A self-printable version of your certificate will be available the moment you pass the final test in the course (it’s perfect for proving your credentials or attaching to job applications). You can also order a premium-quality professionally printed version. A genuine certificate you’ll be proud of. Passing the Creative Colouring Course online course will be an achievement you’ll be proud of and one that could even enhance your career prospects. You can also simply frame it to impress your friends and family! Many online course providers only offer their own non-accredited certificate, however because of our accredited status as an education provider, you gain a real certificate that has met strict criteria. Creative Colouring Course is a respected certification provider on LinkedIn. The moment you’ve passed the course you’ll be able to add your certification to your LinkedIn profile with one-click, right from your student account. Members with a Creative Colouring Course certification on their LinkedIn profile get contacted 6x more often – leading to more opportunities. Perfect if you’re hoping to go into design or illustration as a career or looking to attract clients.